California voters on Tuesday rejected a first-of-its-kind ballot measure that would have placed a 15 percent revenue cap on private dialysis clinics in the state. "Voters voted to protect patients," said Kathy Fairbanks, spokeswoman for the No on 8 campaign. Placed on the ballot by SEIU United Healthcare Workers West (SEIU-UHWW), the measure would have limited dialysis clinics' revenues to 115 percent of "the sum of all direct patient care services costs and all health care quality improvement costs." According to the Legislative Analyst's Office, these costs include "non-managerial" staff wages and benefits, staff training and development, drugs and medical supplies, facilities and electronic health information systems. Other costs, such as administrative overhead, would not be counted toward determining the revenue cap. Any revenues above that 115 percent threshold would need to be returned to whoever paid for the treatment, either the patient or their insurance provider. “This is only the beginning; we are in this for the long haul," said Emanuel Gonzales, a dialysis patient care technician, in a statement released by the Yes on 8 campaign. "We intend to re-file this initiative for the 2020 ballot in California, and we are preparing to bring it to other states in the 2020 election cycle. We also plan to file a new version of Senate Bill 1156, which would stop a scheme used by the dialysis corporations to boost their profits, but was vetoed by Gov. Jerry Brown. We are working to file that legislation in a number of other states, too." About 80,000 Californians get dialysis treatments at private clinics each month, according to the Legislative Analyst's Office. 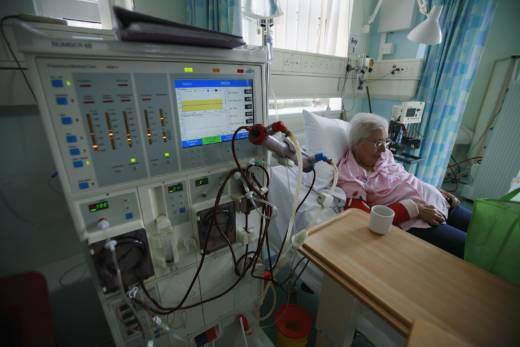 Dialysis mimics the role of healthy kidneys, filtering a patient's blood via a machine in a process that lasts several hours and needs to be done three times a week. Both sides of the issue said they were acting in the best interest of dialysis patients. Proponents, led by SEIU-UHWW, pointed to reports of malfunctioning equipment, dirty clinics and lack of staffing that they say are emblematic of an industry looking to cut corners at the expense of patient care. "This is an industry that has operated under the radar for too long," said Sean Wherley, a spokesman for Yes on 8, in an interview before Election Day. Wherley pointed to the fact the DaVita and Fresenius Medical Care, the two large corporations that operate 72 percent of the dialysis clinics in the state, pulled in nearly $4 billion in profits in 2017.He said Proposition 8 would have pushed dialysis clinics to invest more in patient care by increasing hiring, purchasing new equipment and improving facilities. The measure didn't explicitly force clinics to make these changes, but increasing costs in these areas covered under the umbrella of "direct patient care services costs and all health care quality improvement costs" would help them avoid having to refund revenues. Opponents countered that the cap would force them to close clinics, forcing patients to travel farther to receive life-sustaining care. They argued it would especially hit clinics that serve primarily low-income patients covered by Medicare or Medi-Cal. Dr. Bryan Wong, a nephrologist who serves as the medical director at a Fresenius Medical Care dialysis clinic in Oakland and opposes Proposition 8, compared the situation to the lack of grocery stores in disadvantaged neighborhoods. "The likes of Safeway and Lucky and Ralphs and Whole Foods, they also make lots of profit. Why would they want to operate in a neighborhood that is unprofitable?" he said in an interview before Election Day. It's unclear how the impacts of the cap would have played out. This would've been a first-of-its kind regulation by a state government over a private health care industry. There was also uncertainty over which costs would've counted toward the cap, such as staff members who serve both managerial and patient care roles. Proposition 8 was by far the most expensive of the 11 statewide propositions this year. Opponents of the proposition spent more than $110 million, blanketing the airwaves with TV ads encouraging voters to reject the measure. The overwhelmingly majority of that spending—more than $100 million—came from DaVita and Fresenius Medical Care. That dwarfed the $20 million spent by supporters of the measure, who said the dialysis companies used their deep pockets to control the narrative around the proposition. "They succeeded in scaring the newspapers that the industry will collapse," Wherley said, referring to the fact that every major newspaper in the state opposed Proposition 8. Editorial boards across the state pointed to the measure's role as a bargaining chip (SEIU has unsuccessfully tried to unionize dialysis clinic workers), the unforgiving nature of the initiative process and the uncertainty surrounding the impact of the proposition as the reasons for their disapproval.